The vision of Holly Springs Center is to enhance community unity for all ages through opportunities for growth, exploration, creativity and connectivity. 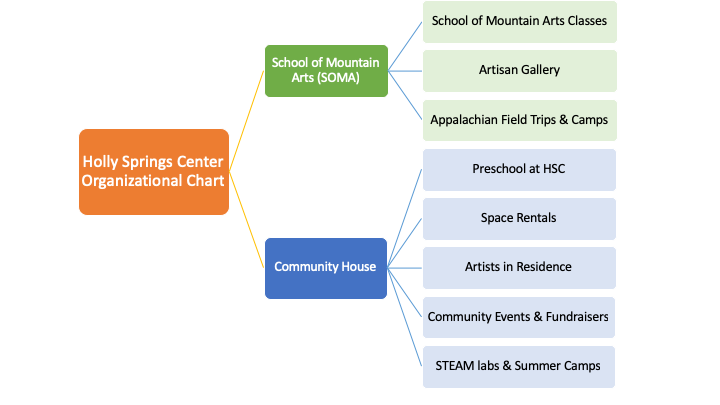 Holly Springs Center will strive to be a persistent and sustainable entity by generating various sources of revenue from classes, workshops, field trips, grants, foundations, etc. for services offered from both branches of the Center; Over time, as the number and variety of services increase, student and patron fees will cover most of the costs of operating Holly Springs Center. The purposes and goals of the activities for K-12 students provided by the two branches will be in concert with the current state standards for education.